If you were looking for a rare Pokémon and encountered the sign above, what would you do? Because I’d pay up to get whatever pocket monster was lurking within. Ingress and Nintendo don’t seem to have made paid in-game locations a part of Pokémon Go’s business model right now (for that, look to in-app purchases), but the ability the app has to drive real-world foot traffic to locations is undeniable. 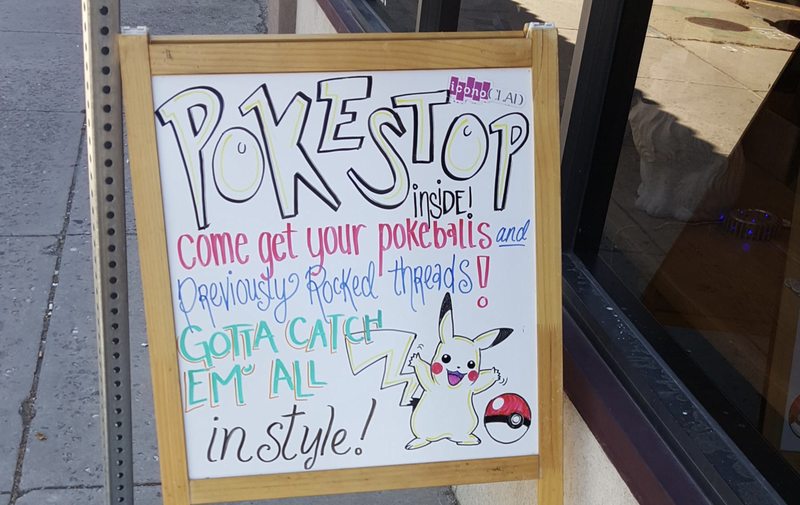 The example above was posted to NeoGAF forums, but others abound, and some businesses are going the other way and using their Poké-presence to encourage folks to come inside. Currently, PokéStops and Pokémon Gyms (key real-world locations and landmarks that Pokémon Go players visit to acquire collectibles and do battle) are pulled from the location database of Niantic’s original location-based AR game, Ingress. Those locations are generated through user submissions, which are open to anyone in the user community, and which are vetted by Niantic before being added to the public database. Ingress used sponsored in-game locations to drive revenue, too. Bank of Tokyo-Mitsubishi UFJ teamed up with Niantic for a big branding campaign, for instance, which included uses its ATMs as “portals” within Ingress, as well as the introduction of a branded in-game object. Other sponsors for Ingress locations include Zipcar, AXA and Circle K, to name a few. “I think that, we hope to end up with a model where, potentially there could be a cost-per-visit type model where large brands and small brands, as well, could sponsor different elements of the game, with the end of interacting with players and really tapping into that enthusiasm of players,” he told the publication in 2014. Already, people are using the tools made available by Niantic and Nintendo in Pokémon Go to capitalize on the potential for real-world traffic. Forbes contributor Jason Evangelho details how smart business owners are using “Lures,” an in-game item that turns any existing PokéStop into virtual feeding frenzy for players looking to catch Pokémon. But this requires there to already be a PokéStop nearby – so naturally, businesses are already looking to get Niantic to add ones to their locations. For businesses of all sizes, a game with this kind of engagement is definitely better than just dumping a wooden sandwich sign out on the sidewalk.